We embracing the heat with Scifi July, our author of the month, Octavia Butler as well as this month's gemstone, Ruby. This month we are celebrating Independence Day in the United States in honor of the signing of the Declaration of Independence, 241 years ago on July 4, 1776. July is also National Blueberry, Hot dog, Ice Cream and Cell Phone Courtesy month. Let's not forget Video Game day, Embrace your Geekness day, Global Hug Your Kids day as well as Ugly Truck Day and Threading the Needle Day. 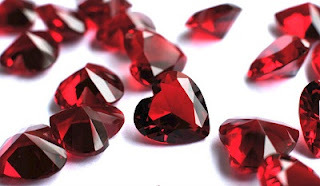 Our birthstone of the month is one of my favorites - Ruby. Is anyone else thinking of Dorothy with her ruby red slippers. There's no place like home. You may choose to spell out the word, reading one book per letter or read a book with the name or the colors of the stone in the title. Or perhaps find an author whose name is Ruby. You may decide to find a book set in the time period where the birthstone was discovered or surrounding the myth and lore or set in countries where the birthstone is currently found. Rubies were originally discovered in Myanmar (Burma) in the ancient times and soldiers thought the stones made them invincible. Rubies have long been believed to symbols of passion, protections and prosperity. They were traded along China's North Silk Road and the stones were buried beneath the foundations of building to secure good fortune. Thailand is the main source today and the gemstones area also found in India, Madagascar, Russia, Kenya, Afghanistan and Pakistan. Our armchair travels continue as we delve into Science Fiction this month. According to the Gunn Center for the study of science fiction, the genre is the literature of the human species encountering change through science, technology, and cultural shifts as well as ideas and philosophy, alternative point of view and an approach to understanding the universe. More simply put, it is speculative fiction about the future, taking us through time and space and parallel universes. The sub genres vary from alien invasion to steampunk to artificial intelligence to nanotechnology to space operas. World's Without End has always been a fun site to explore when it comes to finding science fiction and fantasy reads. Other sites include Unbound Worlds, Tor, and SFFworld. Our mini challenge - Mind Voyages - also provides a variety of Hugo and Nebula award winners and nominees from which to choose. Octavia Butler, our author of the month, won numerous awards for her science fiction short stories, novelettes and books. I have Dawn in my book stacks to read this month and will talk more about Octavia next week.